Jeanne Maurand of Hamilton and her father, Bob Yntema of Ipswich, relax in the garden at Rest.Stop.Ranch in Topsfield, MA. 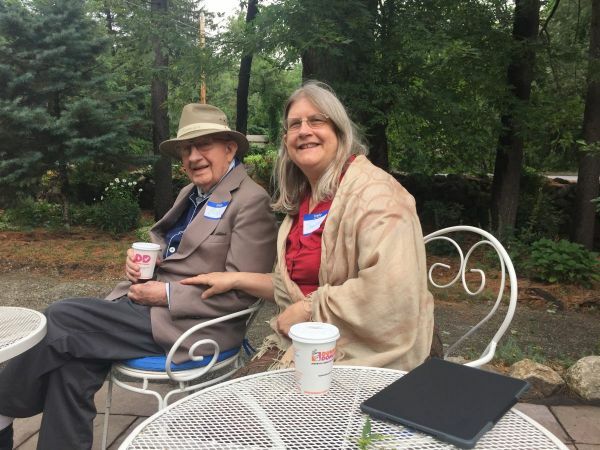 In recognition of November being National Family Caregiver Month, Mary E. MacDonald and her spouse, Karl R. Ackerman, will speak at the Topsfield Congregational Church Emerson Center on Sunday, November 20 at 11 am, about the Memory Café they offer at their Topsfield, MA Rest.Stop.Ranch. The public is welcome to attend this free program. Herself a survivor of a difficult dementia-care journey, Mary became a certified life coach, group leader, and Kripalu Yoga teacher, and founded MaryMac Missions and Rest.Stop.Ranch in 2010. Mary holds an M.A. degree in Pastoral Ministry from Boston College and graduated Phi Beta Kappa from the University of Rochester with a B.A. degree in Psychology and German. At Rest.Stop.Ranch, their Topsfield home, Mary and Karl offer two services for long-term-caregivers and people of all ages who are living with chronic illness and disability. One is a monthly Sunday Stroll and Memory Café in their wheelchair-accessible gardens (April – October), and the other is a two-hour Guided Individual Respite Retreat at the Caretaker’s Cottage (year-round, by appointment with Mary). The beautiful wheelchair-accessible gardens at Rest.Stop.Ranch provide a renewing environment for caregivers, care receivers, and survivors of long-term care. Every Memory Café event offers a multi-therapeutic approach, through horticulture, music, movement and art. Social, emotional, and spiritual support is available through interactions with specially trained staff and volunteers.